Latest House Updates: New Lights and Home Automation Switches - Dads Change Diapers, Too! 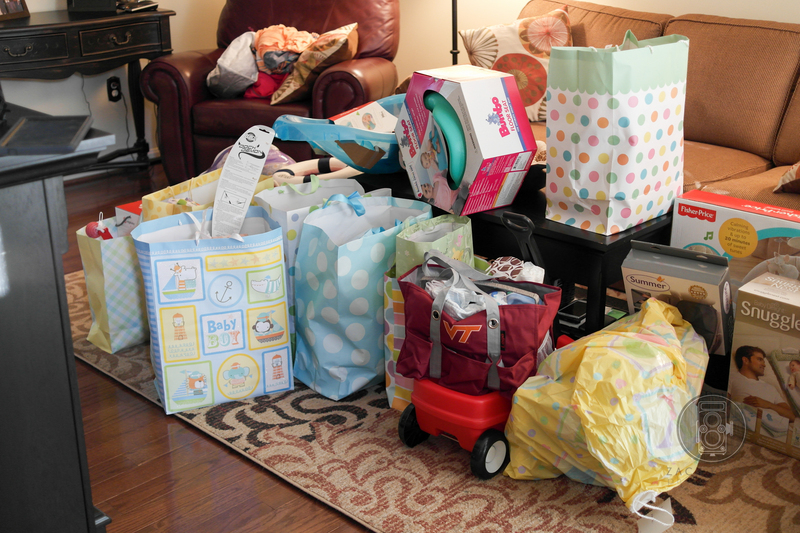 Kicking off the first of the home renovation posts (and trust me, there are a ton coming down the line) is just a short one with a quick one hour update I made earlier this week. 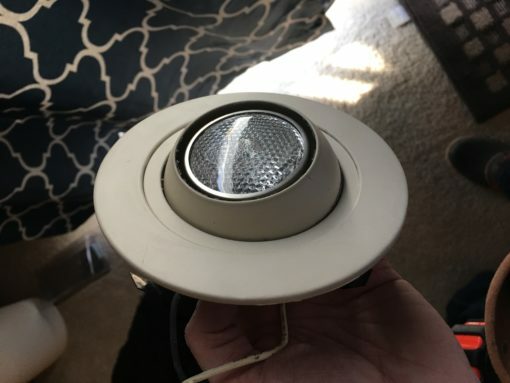 We had a couple of these old eyeball lights (seen above) right in front of our fireplace. We had renovated the fireplace a few months ago, and the “Smoked in the house 24 hours a day for 20 years” white coloring of the lights just didn’t match the decor anymore. It was time to replace them! Part of the fun of renovating a house, besides getting to see the finished product, is learning how not to kill yourself in the process. In particular, there are a few things that scare me enough to pay someone to do them, but in general I’m pretty good with most things. 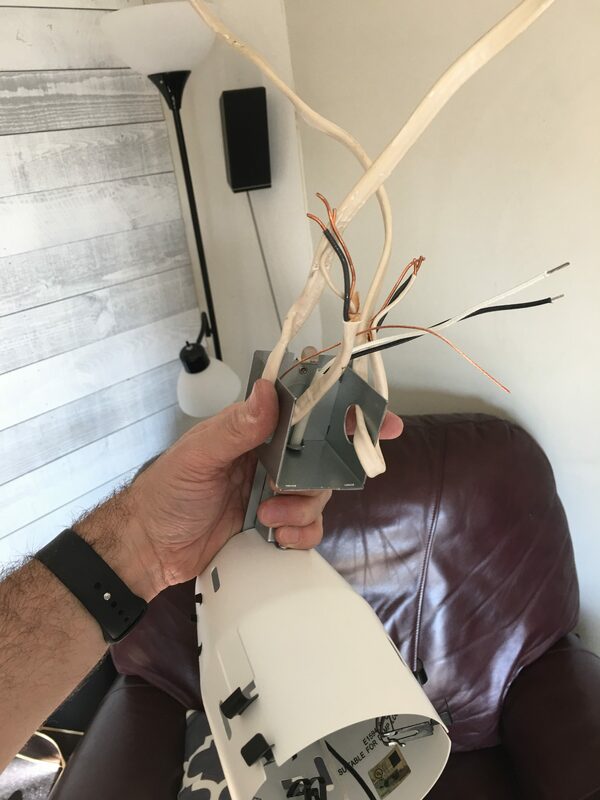 Want to wire up new lights? Real simple way to make sure you don’t kill yourself. Is the light on when the switch is thrown? Did you cut the breaker? If you can answer yes to both of those questions, you should be safe! Worse comes to worse, pick up one of these Non-Contact Voltage Tester, just to be safe. I won’t lie. I pulled this pile of…disaster out of the ceiling and immediately started worrying that the house was going to burn down. I followed my own rules, killed the breaker, tested the load lines, blah blah blah, but there’s just something scary about realizing that the wires you hold in your hands could knock you on your rear in a heartbeat. I’ve been zapped before, it’s not a great feeling. Take electrical work seriously! Don’t take unnecessary risks when you’re doing this stuff. Okay, so we got both eyeball lights down and unwired, and decided to put up similar lights, just in a standard white. 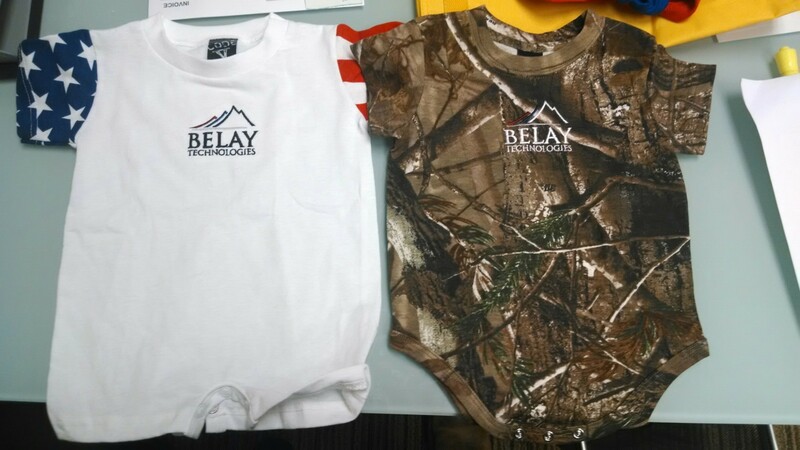 We went with something similar to these. Real simple install, and there wasn’t a ton to have to do to mount them. 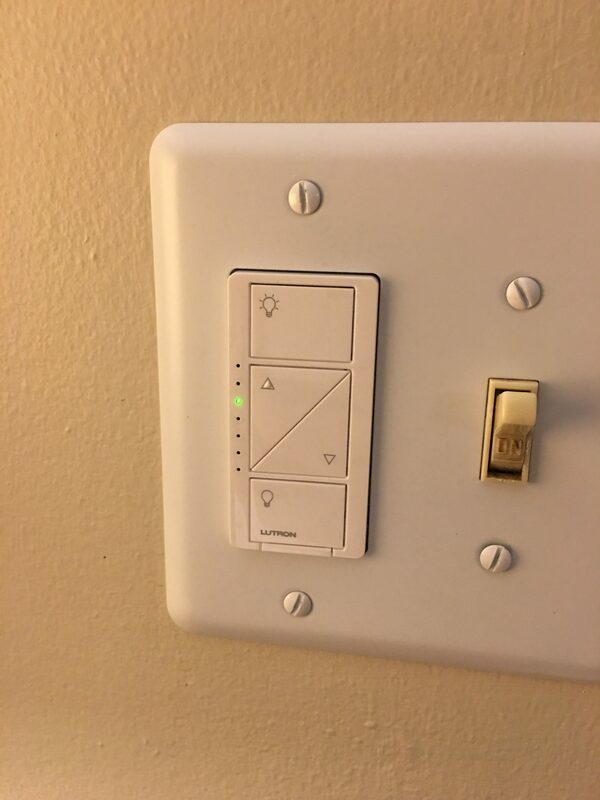 Great, so now we’ve got these fancy new lights and…as one friend on Instagram put it, a dimmer switch that appeared as though it could give you an STD. This is where the real fun comes in. As I’ve stated in previous posts, I’m a huge fan of home automation. 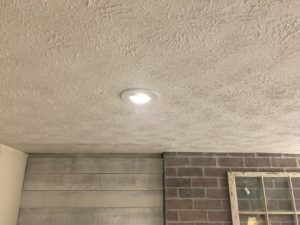 Since started this blog, we’ve added more and more items to our automated home, and the sky’s the limit with what’s out there. 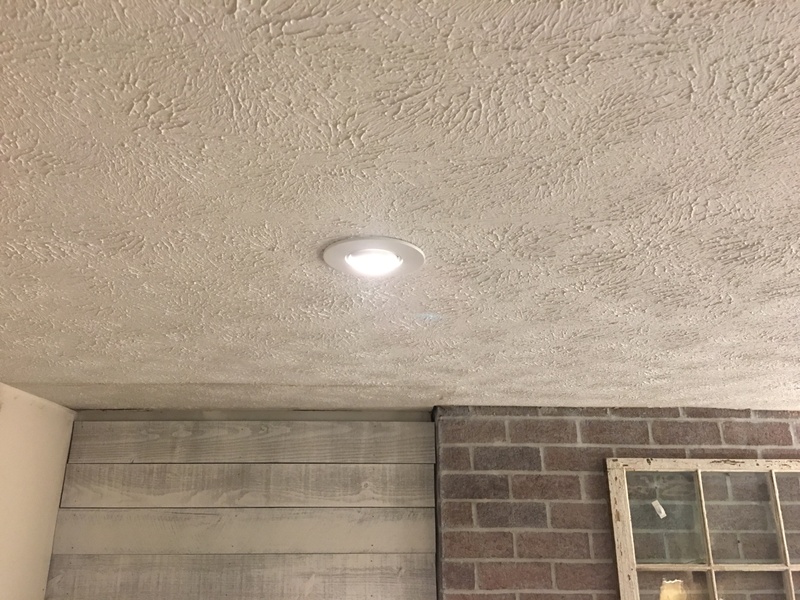 To control these lights, which I had originally thought about replacing with actual smart recessed lighting (we wanted gimbal-style lights, though), we decided to replace the old, STD slider, with a Lutron Caseta Wireless In-Wall Dimmer Kit . The Caseta works with our already-existing Wink Hub system, which in turn allows our Amazon Echo and Echo Dots to control them by voice. We can set up groups, and services (which Wink calls Robots), that allow us to perform all sorts of functions. When we bring #2 downstairs, I can call out to our Echo, “Alexa, trigger baby mode” and all of the lights in the kitchen dim to 1% strength, the lights in our family room go off, and our new eyeball lights dim to 1%. It gives us enough light to see, but also doesn’t prevent the wee-one from sleeping. The best part is that the Caseta has a remote, so if you’re without your phone or, heaven forbid, without your voice, you can still control the lights without getting up off of the couch. So now we have two new fancy lights, which can be controlled from hundreds of miles away, or just from the couch! Thanks for posting! Hopefully the next one is a suggestion on lighted ceiling fan control…. Previous story Where have I been, and Where am I going?